Yes, yes, and more yes. Did I say yes? I simply absolutely ADORE this product. I used it in conjunction with my Q-Redew as a pre-poo and detangling treatment. My hair was super soft, detangled like a dream, and just managed to be everything I ever asked of it. Once I rinsed it out of my hair, I didn't even want to wash it anymore! My hair was so silky, smooth, and soft - if I hadn't needed to get my scalp clean, I would have just left my hair as-is. This product FAR exceeded my expectations! I think I'm in loooooooooove....again (cue: Andre 3000). Cetearyl Alcohol is a combination of Cetyl and Stearyl fatty alcohols. Acts as an emulsifying agent responsible for the creamy feel of conditioner and softening hair. Behentrimonium Methosulfate is a mild detangling ingredient made from the rapeseed (canola). Known for great detangling without leaving product buildup on hair. Stearic Acid is a naturally occurring fatty acid that acts as a surfactant, cleansing agent, and emulsifying agent. Potassium Sorbate is a potassium salt of sorbic acid, a naturally occuring antimicrobial compound used as a preservative. Musa Sapientum (Banana) Fruit Basil Oil Potassium rich moisturizing oil combined with basil, which stimulates circulation and blood flow to hair follicles, promoting growth. Persea Gratissima (Avocado) Oil: Moisturizing oil extract that can penetrate the hair's cortex and strengthen hair. High in Omegas 6 and 9, leading to improved shine and elasticity. Kurlee Belle products are available exclusively online at www.kurleebelle.com. I wish upon a star that I could find this deep treatment on my shelf at Target... Just putting that out there (I like to believe we can speak things into fruition). At $16.00 for 8oz, I'm not head over heels about the price. I'd feel a little more comfy about maybe 16oz for $20? That's just me trying to be cheap though. Nevertheless, there's two areas in my regimen that I'll spring for - a good deep treatment, and a good curl definer. This just so happens to be one that I'll drop the dough on. 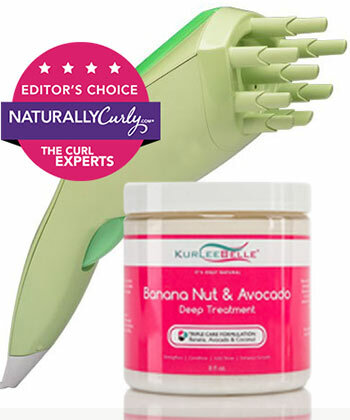 All of the Kurlee Belle products, Banana Nut & Avocado Deep Treatment included, are free of parabens, sulfates, pthalates, mineral oil, PABA, DEA, synthetic color, petroleum, and propylene glycol. The products are also vegan, as well as cruelty and gluten free. Even if those things don't matter to you (and I will be doing an article soon on why they should), the product is amazing at doing EXACTLY what it says it would do. All while maintaining a gentle banana scent that isn't offensive to my senses (which is amazing, because I typically can't stand anything banana). The only drawback for me was size. Because my hair is on the longer side, thick, and I tend to be heavy-handed, I wish this product were available in a 16oz size. 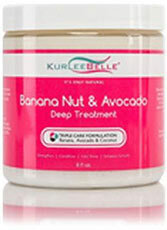 Other than that, I have absolutely NOTHING bad to say about the Banana Nut & Avocado Deep Treatment! I HIGHLY recommend this product for transitioners. Naturals too, but especially for the ladies out there struggling with balancing two textures. Transitioning hair needs moisture, and it can be difficult to adequately and sufficiently moisturize both textures without leaving one short-changed. Sometimes, conditioners and treatments can make the natural hair feel like a dream, and the damaged or relaxed ends feel stiff, rough, brittle and dry - or vice versa. Some conditioners can even leave the straight ends stringy and oily. But not this product! I absolutely cannot find a single thing wrong with the ingredients and delivery of this product. And that's EXACTLY why I love supporting small business.